Thinking by Peter Davidson: Do You Wear Your Bluetooth Headset Around? When can you say that a technology has reached a point where it really is broadly accepted and adopted be everyday people? I used to see Bluetooth wireless mobile phone headsets on middle aged men driving expensive cars. Early adopters to be sure. Now, increasingly, I am seeing them on middle aged professional women at the grocery store. These things are truly useful when you are on as call but for a woman to just wear them around and visually scream "I'm a geek!" is remarkable. That being said I wonder what the different genders perceive the message they are sending. For men it's all about the cool factor and priding themselves on having the latest and greatest technology. I think men would wear them when they are with their friends and coworkers. Women, by nature use them because they are useful and practical but they are a bit of a barrier with face to face "copresent" interactions. I doubt many women would wear them when they are with their friends. The message they send is "I'd rather talk with someone on my phone than speak with you." What do you think? What is your take on men and women using Bluetooth wireless headwsets? You got it right, David. 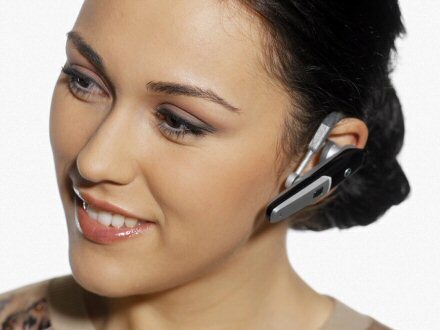 I see women with the ear-attachments, but they are clearly talking business - in a social setting, it's quite taboo. More and more young (30 and younger) women seem to be utilizing the WiFi solution, though. They carry on multiple IM conversations, so maybe they can do the wifi thing, and also talk face-to-face? (I doubt it. )We baby boomers are slower to adopt this convenient way to connect - we're getting our feet wet with blogs, and PDAs, so...the wifi headsets will follow. I, personally, crave one! When I see folks wearing the bluetooth headset on the weekend, I think they look silly and people need to focus on enjoying what they are doing and not catching the next phone call. Way too much time is spent on the phone. An overated appliance from someone who is too young to think so. Scariest is seeing them on the playground. Now that's together time with your kids. I call them "people walking around talking to the voices in their heads." The wind chill has been below zero the last few days. I found much better to wear a bluetooth headset in this type of weather. It is better to press one botton to answer & hang up calls instead of taking your gloves off, getting the phone out and answering it. My girlfriend loves the idea. Please forward this email to Product Manager or Purchasing Department. Thank you very much! We are In-Tech Electronics Ltd from HongKong, China. In-Tech is a well established ODM/OEM manufacturer of Bluetooth products, such as bluetooth mono and stereo headsets, USB dongles, traveler speakers and after market hands-free car kits. Among our global customers are names like Carrefour, Philips, Anycom, Argos, Hama, HP, Logitech, Conrad, Vivanco, etc. Hopefully, you will be our partners in near future! If you' d like to get a quotation , please don't be hesitant to contact us. I think women should not be allowed to use the telephone because they are socially inept and will probably wreck a marriage with it. You say geek I say bluetooth douchebag. I just bought a blue tooth and can't get it to fit comfortably in my ear. I like this Women, by nature use them because they are useful and practical but they are a bit of a barrier with face to face "copresent" interactions. I doubt many women would wear them when they are with their friends. The message they send is "I'd rather talk with someone on my phone than speak with you." Hey i was waiting for a post like this , very useful. I personally wear my earpiece all day during the workday for several reasons. I'm a small business owner and have to respond to my clientele quickly, preferably on the 1st or 2nd ring. It's unprofessional to answer 3 or more rings later. I never know when a call will come in, so why take it out and struggle to put it back in when a call comes in? Secondly I wear in out in public so as NOT to disturb other people. I get super irritated when a phone is ringing and someone's digging in their bag or pocket to find it, then they have to look at the phone to find the correct button to answer. This takes about 4-5 rings on average. These people usually have an obnoxious ring tone as well. Very disruptive! I keep my phone on silent or really low and I hear the ring in my earpiece. Thirdly, I have kids, dogs, run a business, volunteer, and often am doing something with my hands. It's much easier to answer by pushing a button in my ear than putting down whatever it is I'm doing, locate my phone, pick it and and then have to STOP what I'm doing because one hand is holding a phone. Fourthly, I often just plain forget it's there. I put it in in the morning, run around, get used to it and just plumb forget. When I meet friends they tease me, I take it out and on with my life. Fifthly, I use it to answer while driving so as not to engage one hand by holding a phone. You've seen the drivers who hold that brick to their head and don't signal, don't use head checks, and only have one hand on the wheel. Sixthly, there are some studies that show that cell phones emit a certain level of radiation and it's safter to keep the phone away from your body (check ewg.org as one source). So those who get offended by ear pieces, get over yourself. I wear it all day to make your life easier by not hearing about my life. I wear it to make my life easier, safer and more managable. It's not about feeling important, it's not about superiority. If you honestly feel that ear piece wearers feel superior, then YOU have a complex! And don't ask me to not talk on the phone, cuz it just isn't going to happen. Hmm.. people really like very much such new technology in their day to day life. This is very nice technology. If your hands are not free, bluetooth device is the best option for them. I work for a banking firm who encourage employees to use bluetooth headsets instead of mobiles. We all use them and they work very effectively. I wear mine from about 8.00am when i leave home until 8.00pm when i go to bed. I also use mine at weekends so i spend about half of my week with it in my ear. My 10 yearold daughter uses a hellokitty headset and she says its fun. I think that they are a practical and fashionable idea and in a few years we'll all have one. I am 30. There are about 15 girls in my office who do the same as me and i know of at least 40 other people under 35 who use headsets. They arn't just for fat middle aged men and middle aged women. I got a headset 6 months ago and now i only take it off when i go to bed. My hair completely covers mine so i don't look like a geek. I use it for work and private calls and is just so handy. I moved house recently and had to get rid of my homephone line (its complicated). I therefore use a bluetooth headset all the time when at home and always keep my phone in a cup board. i wear it when i go out and when in the car. I take it off unless i get a call at work. i think that they are a great invention.